The hestiaterion (a dining facility; lower right in the photo to the left; photo © 2001 Soprintendenza BB.CC.AA.di Catania and used with permission; hover over to enlarge) is the best preserved structure of a monumental complex that dates to the middle of the fifth century BCE. The site can be attributed to the local Sikel leader Ducetius who at that time founded a federation of Sikel cities that resisted the expanding power of Greek Syracuse and made its capital at the Sanctuary of the Palikoi at Rocchicella in the territory of Mineo, Sicily. The marker points to the general location of site, across the valley from Mt. Etna. In addition to the hestiaterion ('H' on the plan at the left; the photo below is oriented like the plan; hover over to enlarge) the monumental layout of the sanctuary included at least two stoas (buildings with a series of rooms and a shared colonnade) set on a series of terraces descending from the grotto towards the Naphtia lake. A large platform ('P' on the plan) created a terrace on which a forward exension of the hestiaterion was built during the Hellenistic period. Aerial view of the hestiaterion. In its original form (as seen in the plan above), the hestiaterion consisted of four lateral rooms each with a square plan (roughly 5m along each side) and three smaller rooms (roughly 3m along each side) arranged around a central space which was open to form a monumental entrance along the southern side (rendering looking into one of the dining rooms at the left; hover over to enlarge). In the larger rooms, the banqueters reclined on dining couches (klinai) the way one would at a Greek symposion. The dimensions of these rooms permitted the placement of seven couches per room. The smaller rooms were, instead, most likely service quarters. 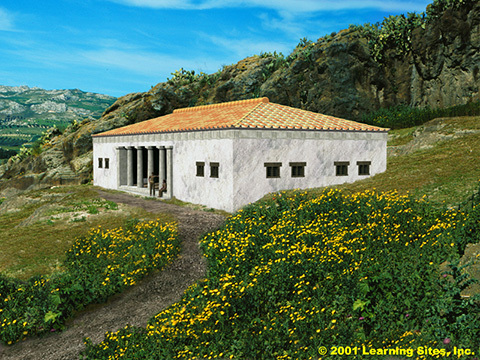 Rendering from the Learning Sites virtual reality reconstruction of the hestiaterion. View (northwest) of the exterior front and side. 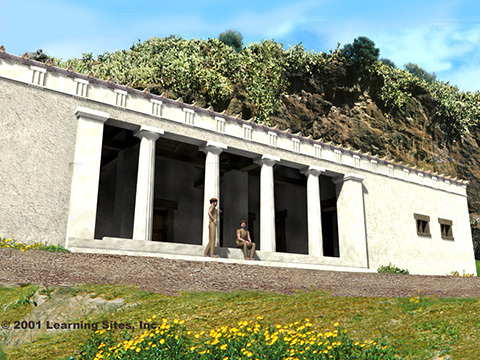 Rendering from the Learning Sites virtual reality reconstruction of the hestiaterion. View (southwest) of the rear and side. 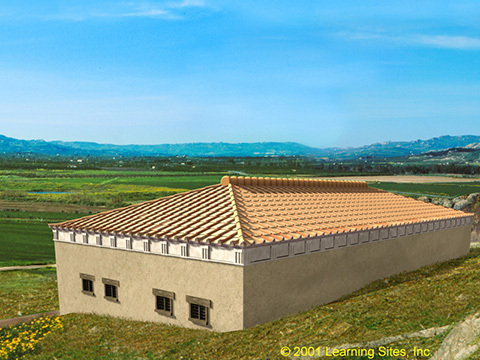 Rendering from the Learning Sites virtual reality reconstruction of the hestiaterion. View of the main central space, showing dining rooms along the far side. 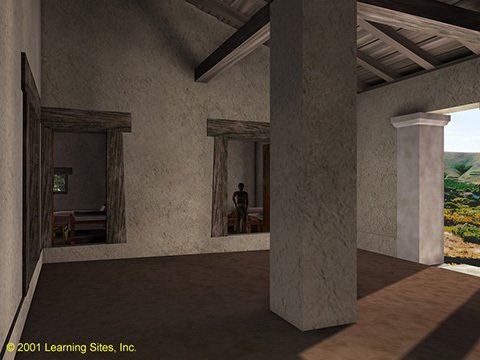 The interactive virtual reality computer model created by Learning Sites was developed under the direction of the buildings' principal investigator, Dr. Brian McConnell, and is based on a detailed analysis of the remains discovered in the excavations undertaken by the Superintendency for Cultural and Environmental Resources of Catania, Sicily. The digital reconstruction includes a wooden hip roof structure with terracotta roof-tiles. Careful study of the entrance step into the wide central area suggests that there were four columns and a frieze of triglyphs and metopes along the architrave (see the reconstruction rendering at the left; hover over to enlarge); see photos of the evidence below. Fragment of an anta base providing some evidence for the layout of the facade columns (photo © 2001 Soprintendenza BB.CC.AA.di Catania and used with permission). Fragment of a sima block showing the decoration (photo © 2001 Soprintendenza BB.CC.AA.di Catania and used with permission). The interactive model and linked images and text were made available for public viewing on computer kiosks erected at the site interpretation center. Assessorato Regionale BB.CC.AA. e P.I. Project completed in 2001; Webpage authorization #6094 issued on December 17, 2001, by the Soprintendenza per i BB.CC.AA. di Catania, Assessorato BB.CC.AA., Regione Siciliana. Superintendent -- Dott. Ugo Gioviale. Section Head --– Dott.ssa Maria Grazia Branciforti. Project Director --– Dott.ssa Laura Maniscalco. Architectural Reconstruction –-- Dr. Brian E. McConnell. Computer Modelling and Programming --– Learning Sites, Inc. [Dr. Donald H. Sanders, President; Mr. Eben R. Gay; Mr. Geoffrey Kornfeld; Mr. Richard C. Morse]. Field Archaeologist --– Dott.ssa Claudia Cirelli. Architectural Illustration --– Mariella Puglisi. Thanks are acknowledged also to the various workmen and scholars who have contributed their energy and suggestions to this project. © 2001-2019 Learning Sites, Inc.